FIPS is a cross-platform FITS viewer with responsive user interface. Unlike other FITS viewers FIPS uses GPU hardware via OpenGL to provide usual functionality such as zooming, panning and level adjustments. OpenGL 2.1 and later is supported. 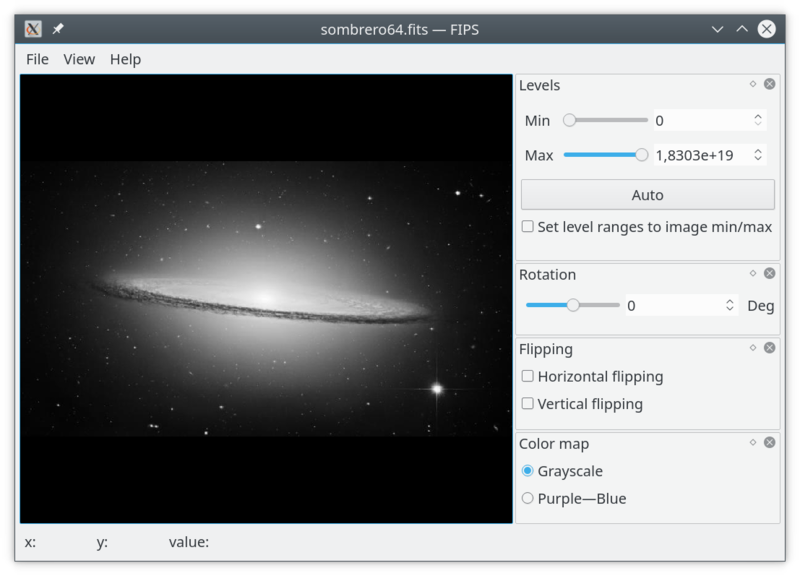 FIPS supports all 2D image formats (except for floating point formats on OpenGL 2.1). FITS image extension has basic limited support. FlatPak is cross-distribution Linux desktop package manager with isolation. If you haven’t found your distro above then you can build from sources or contribute building packages for your favourite distro. Let us know to insert missing instructions. fips3 is maintained by matwey. This page was generated by GitHub Pages.